Number 1 Mom, huh? Yeah you are. What the hell is going on here? Happy Mother’s Day to me…a hot mom just flaunting her trunk. I got this email this morning and immediately thought, “hmm… that doesn’t look like my mom.” I’ve seen a bunch of college girls that look like that though, and if I’m generous…a few moms with babies. So, c’mon, MLB, fess up…how many 2 year olds are on your email list? You got that market cornered. 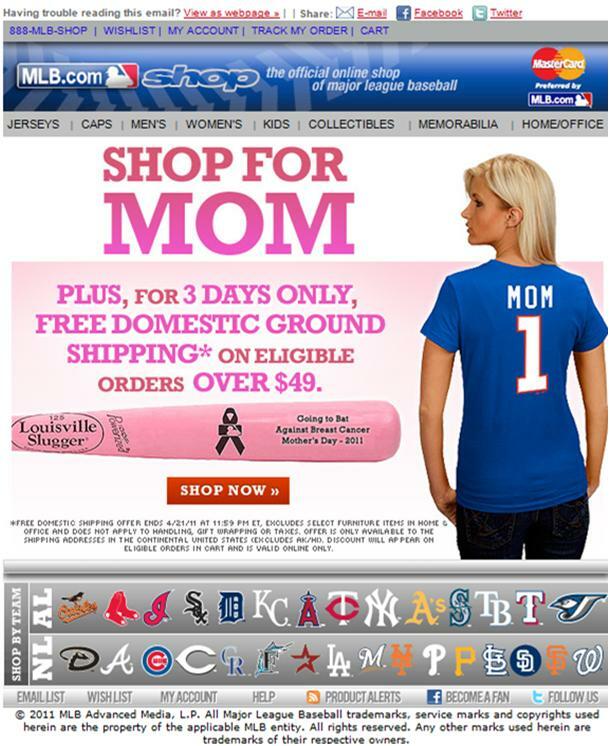 This entry was posted in Baseball, Entertainment, Events, Fashion, MLB and tagged Happy Mother's Day, MLB, MLB shop, MLB.com, Number 1 Mom. Bookmark the permalink.